them into a surface that magnets will stick to.Ideal for home, office and school. WHAT CAN I HANG ON MAGNET PAINT? Magnet Paint, also known as magnetic paint is a water-based emulsion that contains fine iron particles, which allows magnets to stick to it once dry. Once you have transformed your smooth surface into a magnetic surface using this paint you can use it just like you would a noticeboard or fridge to create awesome displays. 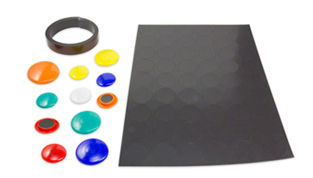 Using our magnet selection packs, you can easily create a collaborative presentation space, interchangeable picture gallery or an interactive playroom wall; although any of our office and noticeboard or novelty magnets are suitable for use on Magnet Paint. Magnet Paint does not provide strong enough magnetic attraction to hold permanent fixtures like shelves or rails. Instead, it is designed for mounting documents, posters and framed pictures. If you would ordinarily hang it with pins, tack or small nails then you will be able to mount it on a Magnet Paint wall with the right magnets. Contact our experts today for advice. HOW TO APPLY MAGNET PAINT Watch our video, or follow our quick steps for using Magnet Paint. By following these steps, you can apply Magnet Paint to any smooth surface to which you would use regular emulsion and have a ready-to-use magnetic surface in a few hours. Remove any uneven or peeling areas of paint before sanding the surface using fine sandpaper to give the smoothest possible surface. Then, the area to be painted must be cleaned to remove any dust and grease using a clean, damp cloth. Mask off the areas around the surface you are painting to avoid getting stray paint on adjoining walls, ceilings, skirtings and fixtures. Magnet Paint can be applied directly on top of existing emulsion but irregular or highly absorbent surfaces such as new plaster will require a suitable primer, before painting with Magnet Paint. Sufaces such as glass, wood, metal or plastic should all be primed before Magnet Paint is applied. 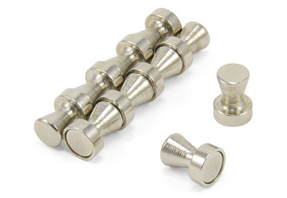 Magnet Paint should be applied using a short nap roller that has had any loose fibres removed. It is recommended that a new, clean tray is used to avoid any contamination of the paint. Mix the Magnet Paint thoroughly for a few minutes to ensure all the iron particles are fully mixed in with the paint. Never mix Magnet Paint with another paint. Apply plenty of paint to your roller and apply to the surface evenly and in straight, vertical lines where possible right up to edge of the area you wish to cover. You should avoid using brushes and overlapping the paint where possible. You should apply three coats, allowing four hours drying time between each coat. Applying less than three coats will significantly limit the magnetic attraction. Leave the final coat for 24 hours before applying your top coat of emulsion, Blackboard Paint or Whiteboard Paint. BLACKBOARD PAINT With Blackboard Paint you can transform any hard, flat surface into a chalkboard.Using regular chalk you can write on it, wipe it off and write on it again. Blackboard Paint can be used on any hard and flat indoor surface. For best results, use as a top coat on top of Magnet Paint to create a truly interactive surface. A single, complete coat is all that is required to turn a surface into a chalkboard. Perfect for children's bedrooms and playrooms, retail displays and menu boards in restaurants and cafes. To apply, ensure the surface to be painted is dry, clean and dust free before thoroughly stiring the paint. You can apply Blackboard Paint with a roller, brush or spray gun and is dry to the touch after just ten minutes. If you wish to apply more than one coat, allow 12 hours between each coat and 24 hours before using. 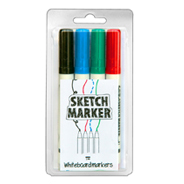 Sketch Paint is a one-coat, two-part paint that once dry turns the surface it is applied to into a writable surface. WHY SKETCH PAINT? Imagine turning any surface into a dry-wipe noticeboard and the possibilities this would bring to your office, school or home. Well, with Sketch Paint you can.Don't want a white finish? Use the transparent version over the top of your current coloured emulsion. HOW TO APPLY SKETCH PAINT To get the most out of and ensure the longevity of your Sketch Paint wall it is important to apply it correctly and use the right equipment. Watch our video or follow our quick step instructions before using Sketch Paint. If applying Sketch Paint to an irregular or highly absorbent surface such as new plaster a suitable primer will be required. If using white Sketch Paint to cover a dark surface, first apply an undercoat of two or three layers of white emulsion before appling white Sketch Paint. If using transparent Sketch Paint, begin by painting the area with the colour of your choice before applying transparent Sketch Paint. Sketch Paint should be applied using a short nap roller that has had any loose fibres removed. It is recommended that a new, clean tray is used to avoid any contamination of the paint. Separate the two tins and pour the full contents of the small tin into the larger tin and mix thoroughly for at least three minutes then leave to stand for five minutes until most of the air bubbles have dispersed. Never mix Sketch Paint with another paint. Sketch Paint must be applied within a maximum of one hour after mixing, however please note if applying in a warm, well ventilated environment the mixed paint should be applied immediately. If painting a large area, use a new roller and tray after each tin. Remove masking tape within one hour of application. Sketch Paint will be touch dry after 24 hours, but you must allow a minimum of five days before writing on your new surface to ensure the paint has fully cured. Writing on the Sketch Paint before it is cured may permanently mark the surface. To maintain the appearance and effectiveness of your Sketch Paint wall we recommend using Sketch Paint dry-wipe marker pens and Sketch Paint cleaner spray. Using budget dry-wipe pens may leave a shadow on your wall once erased. To clean your wall use a dry, soft cloth and never use abrasive chemicals or detergents. 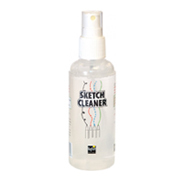 For stubborn stains, use Sketch Paint cleaner spray. For advice, contact our experts today. If you are a stockist of decor, office or educational products then our selection of interactive wall coverings will make a great addition to your range. We offer significant bulk discounts and next working day delivery on our entire range of paint products and magnets. We also offer 30-day credit facilities, subject to credit reference checks and a dedicated account manager service.